Finished quilting my yellow butterfly last night and it is now on my wall with his friends. 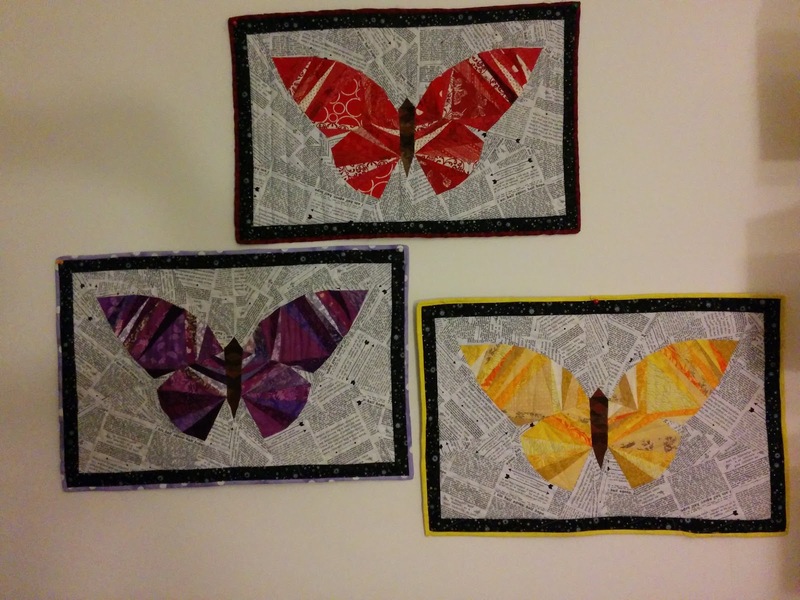 I am done for now doing butterfly but if I ever feel like it, it will be easy to make more and join them into a big quilt with the "Quilt as you go" methode. And it is day 4 of the Art with Fabric blog hop. I am amazed by every quilt. Every quilted project is a unique piece of art, full of love, creativity and inspiration. To explore the endless possibilities of art-inspired quilted pieces I decided to organize a Blog Hop! I invited some of my blogging quilty friends and we are going to present our unique pieces in May! I love your beautiful butterflies. Beautiful butterflies. They sure will make a nice quilt! Your butterflies would indeed make a gorgeous quilt, but I also like them just as they are, on the wall. What a pleasure it must be to look at them as you pass by!